It's been a little quiet around here lately—on the blog, anyway. In real life, it's like a daily chaos BOMB. But a good chaos bomb—if there is such a thing. As you may recall, right after I returned home from Air Force tech school, I began a new civilian job as a Wellness Coordinator. While my part-time and one-weekend-a-month duties with the Air Guard are still going well, my full-time job is taking off like a rocket. And it's awesome. As a Wellness Coordinator for a hospital health system, not only do I manage several programs (like our website, employee and community health education programs, a weight loss challenge, etc), but I am also involved in our big annual healthcare screening process. It has all been so fulfilling and awesome. I'm learning so much and getting to be very creative with my web skills, both managing and designing websites and also blogging often—and actually getting paid for it! The hours have been longer than the standard 40-hour week, but with such rewarding work, it makes all the difference. Needless to say, when you're working 50+ hour weeks and on the computer all day and then doing Air Guard drills one weekend a month—when I have free time, I ENJOY that free time. Unplugging is my new favorite thing. That being said, this blog has taken a back seat in the process. While I don't expect to be back to blogging on a weekly basis, I will still be checking in with updates. For instance, I got to work my very first deployment line with the Air Guard this last weekend. It was so cool! We got to prepare troops for deployment and not only see how the process worked, but got to be the ones sending the troops off as they departed in the C-17! Finally, putting all that tech school knowledge to work! I also recently got a new haircut—woohoo for change! See it here. Despite feeling the rush-rush of the day-to-day, I'm still making time 7-days a week for my workouts (though I do have to several 4:00 am morning starts since my workdays begin so early and I prefer working out in the morning!). I've been spending about half my week in the gym doing high-intensity style workouts and the other half is spent doing shorter 30-60 minute runs outside. I'm not training for anything specific—just trying to stay in good and healthy shape! In between posts, you can still catch up with me on Instagram. Life is good, y'all. A little overwhelming and stressful at times, but life is good. You sound so happy Aunie and it certainly shows in your photos! Glad to hear everything is going so well! Looks like everything is going wonderfully! Chaotic, maybe, but wonderfully so! Absolutely love the new haircut! I would love to go really short again - and blonder - but has it been hard to maintain? How long does it take you to get it ready to go? that haircut looks amazing! I love it! Thanks Shannon! That's a great word for my feeling lately -- happy! Hope all is well with you! Thanks so much, Kelly. Hope you're doing great, too! Kristin, thank you! 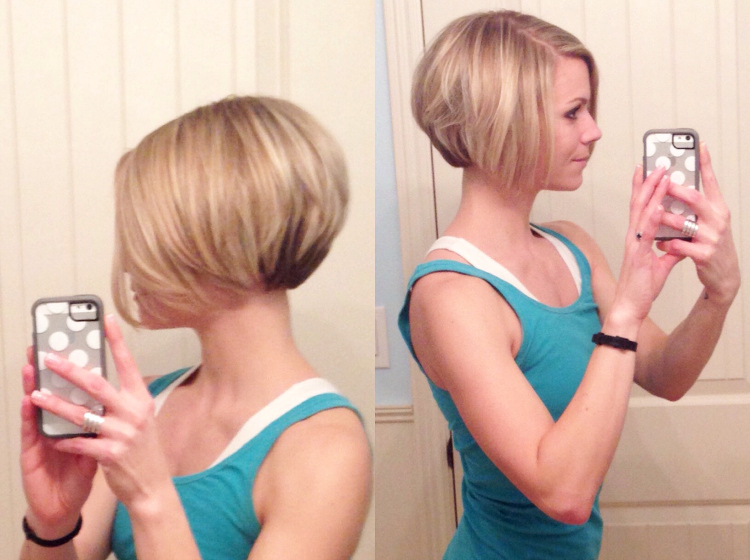 And no--I think this shorter hair cut is much easier! I only wash it every few days and use baby powder / dry shampoo in between. I kind of let it do it's own thing in the mornings. On the first clean day, I'll wash and then blow dry the front with a round brush. I scrunch up the back and just let it dry naturally. That day takes about 3-4 minutes. On the other days, I just get up, put a little baby powder in and run my fingers through it. Then maybe give it a light spritz of hairspray. That's about it! It's so easy! Thanks Laura! I'm loving it, too! One of the things that has kept me from going back to short hair has been the maintenance - it's so much easier to put it back in a bun or a ponytail - but that sounds like something I could manage! I never thought of using the baby powder to keep it fresh - I might try that instead of trying to find a dry shampoo I actually like. Your hair looks fabulous! Glad to hear your new job is going well! Thanks Cori! I so appreciate it! Hi! Im shipping on March 3. Just want to know how will the sleeping attire be like? Do i need to bring sleeping clothes for the entire bmt? Or for just the days while waiting for the uniforms? Will they issue socks for PT? How is the bathing be like? Sorry for too many questions. Regards!! Hi Christina! Wow-you leave tomorrow. You'll be awesome!! Sleeping attire is typically PT gear, as you'll be jumping out of bed and going to PT 10-min later :) I didn't bring sleeping clothes. I slept in my t-shirt and underwear the first night. After that, we had uniforms and PT gear. Yes, they issue PT socks... you have to wear them. They're not super attractive, but they get the job done! Bathing is 60-girls in a 10-minute shower all at once. It's a BLAST :) HAHA. You'll be fine. Just relax and go with it! There is lot of articles on the web about this on topic of .But I like to give you more,although i found one that’s more dateils.It's rather a nice useful little bit of information. Looks like you got to work some of my guys in the Memphis ANG unit recently! Oh really?! What squadron did they go into? Hello :) I just swore into the Air Force DEP and I'm already researching tips for BMT. I've heard different things regarding cosmetics; I'm aware that cosmetics won't be permitted until graduation day, but since you brought your own products upon arrival, were you given a hard time from your MTI? The last thing I need is unwanted attention..
Hi Kristen! They looked at my makeup bag (which was in my "personal" section on my bed) and didn't say a thing about it. They expect it from females and will not give you a hard time. If they do, it's like a 10-second thing. Nothing to worry about, I promise! If you have makeup you swear by--bring it!! What type of atletic shorts for pt are needed, can they be boy shorts, or will I need Capri style? And with the spandex do they need to be tight thin bycicle type or will cotton stretch do?